A loud, shrill whistle signals a blast and it shakes the earth to its core! The big haulers loaded with dirt rumble by, passing the trucks coming to load coal. Dust swirls and coats the nearby trees... That was the past. Today, row after row of vines, laden with grapes, have replaced the noisy dozers, haulers and coal trucks. Hawks circle the skies where dust and noise once ruled. The sparkling blue pond that once served as a brown sediment pond, welcomes quiet fishermen catching bass, bluegill, and catfish. Is it possible there’s a vineyard on a reclaimed surface mine? It is possible, and it is MountainRose Vineyards! This family-owned dream is located in the heart of the Appalachian Mountains. David Lawson had a dream that he could change a little piece of earth in Wise County, Virginia into something better. David is part owner and winemaker of this unique family winery and vineyard. David dreamed of being an entrepreneur in high school and he loved the land that had been in his family for over 100 years. He rooted his first grape vines from a 100-year-old Concord in the family’s yard and planted his first vines while still in high school. David assured his parents that because Wise County had once been a major producer of apples for Virginia and grapes could grow where apples grow, he could indeed grow grapes! David insisted that not only would certain varieties of wine grapes grow, but that the low humidity and cooler temperatures would make a great climate for grapes. David believed that the 'not too rich' soil of the reclaimed land could be broken up and since there is no hard pan in mined soils, the roots would grow deep. So, David convinced his parents to become partners in building the first ever winery in Wise County. Ron and Suzanne retired from their jobs in the public school system and the adventure began. The family began restoring the soil by adjusting PH, ripping and plowing, adding compost, fixing drainage and planting special cover crops. David and his wife Brandi then bought a second small producing vineyard in Russell County, Virginia. The winery was barely completed in time for the first harvest in 2004. "MountainRose", has its own unique history that adds a beautiful, almost magical element to David’s story. 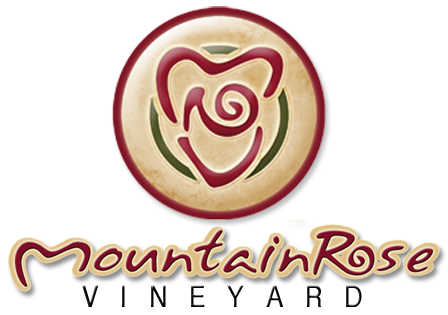 The “Mountain Rose” is a seventh generation family heirloom rose passed down through the family and is only one of the over 100 rose varieties found throughout the vineyard. 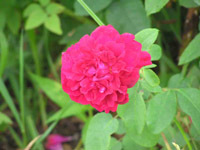 Traditionally, roses in vineyards are considered “the canary in the mine”. If certain diseases show up on the roses, before they are apparent in the vineyard, it can serve as warning or indicator. The vineyards themselves are like a “rose” in the mountains to us, and many others! Visitors love to tour our vineyards and try our wines, being pleasantly surprised when they taste them. Most can’t believe such great wines are being made in the heart of coal country, more famous for coal mine strikes than award winning wines. What brings visitors back again and again is not only the wonderful wine, but a chance to be part of the dream. The truth is, the wonderful white, blush, and red wines of MountainRose Vineyards, not the black coal, are the true hidden treasures of the Appalachian Mountains in Wise County. So, it can be said that dreams really do come true.